Pinkpackrat@Play: A Kettle that Tweets ? 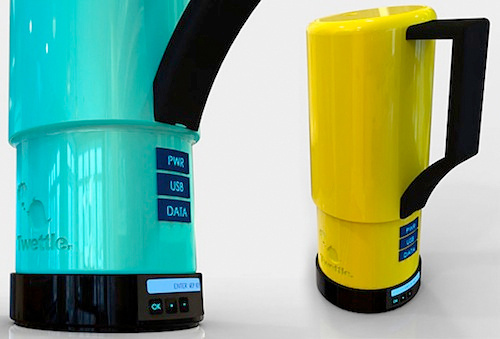 A Kettle that Tweets ? I know interactivity is great and I do love a cup of hot tea in the afternoon myself, but I really don't want my kettle to tweet me when the water boils. I really don't. So, I won't be running out to buy a Twettle, a Wi-Fi activated tea kettle which will tweet you when the water boils. Call me a Luddite, but I prefer the old fashioned, put- it-on- the- burner, kind that whistles loud enough to make the dog howl.There is only so much connectedness I can stand with my appliances-- kitchen or otherwise. It was bad enough when toasters and toilets started tweeting their activities. This is just too much for me. I'm gonna pass on the Twettle. But if you want to know more about it,check out this info from Wired. The specs are geekily cool. The thing can be started with a Twitter DM and boasts an API to allow others to hack into it and add functionality. The two Englishmen who invented it are hoping to make a fortune, and you know what? They probably will. Me, I'll be turning on the gas under my old fashioned kettle till the day I die. It's part of the ritual dontchaknow, but I do like a good cup of tea while I interact with my tweeps. That is hilarious :) I'm sitting about 7 feet away from my kettle, I can hear it when it turns off. No need for Tweets. Hi ladies-- yup talk about a kettle for geeks. I think it is a hoot. but it might actually be a good thing if you are in an office with a lot of people and far away from the kitchen. Other than that I think it is just a toy.